There are vacations where you run as fast as you can to visit every historic site,shop in every boutique store, eat at every restaurant you can find... You wear yourself out and down and become frazzled. In just a few days you're dying to go home where you can rest and relax. You’ll like the peaceful early evenings... a time for cocktails or sipping wine while overlooking the beach from the private deck above the beach - called "The Perch" - and the rolling surf of the Pacific ... and, of course, like at sunset and strolls on the beach .... why would you want to leave Whale Rock? We Old Friends(over 40 yrs) had a wonderful time for Terese’s birthday! The house was immaculate and very comfortable. The view is amazing and walks on the beach were memorable. Even though all of us were a little “under the weather” when we arrived, a few days of ocean air was very healing for all of us. We hope to return sometime soon. We have a “Girls Getaway” once a year and hope to make Whale Rock” a regular destination. Beautiful views and very comfortable! It is a very nice home and gorgeous location. We were so happy to be able to stay in it. Renting a house is a great way to vacation because you have room to move around in (not a hotel room) and you can go to town for meals or stay at the house and make your own meals and relax. 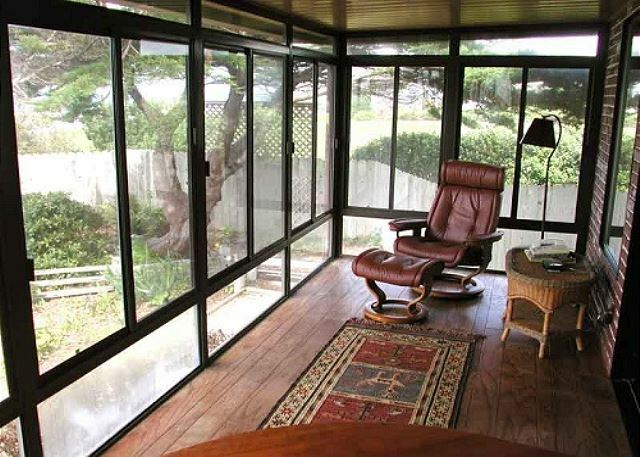 The sun room was the perfect place to read a book! Great accommodations, perfect location. Very quiet and peaceful. Location is great beautiful views, access to the beach at next to the property. Great beach. The home and two bedrooms with direct ocean views. All the necessary amenities, and more. We enjoyed the ping pong table in the garage and other games available. Great weekend for all! Our stay at Whale Rock magical. The home is very comfortable and well appointed. The views are breathtaking. Loved walking the beach and listening to the waves crashing on the rocks. This house is everything it's advertised to be. We didn't want to leave. First off, the location of this home is amazing with beautiful views and stairs down to the beach, perfect. The property manager was great and very responsive. BUT, the dirty carpet and mold in the two spare bedrooms was so bad one friend reacted badly to the mold and coughed her entire stay. We are 6 friends who have been getting together for years, one of us travels from Hawaii. While I wanted to return to Whale Rock this September other members of our group would not return until the mold and carpet are addressed. I did not get confirmation this would be done for sure from the property managers voicing owners discretion. We are going to Sea Ranch next September, BUT I really hope the owner takes care of the mold and carpet...we want to return to Whale Rock! We were greeted with a personal note. House was super clean and furnishings were very nice. Amazing views overlooking a quiet beach. Stairs down to the beach were great. Kitchen is well stocked. Decor was very charming. Comfy beds and lots of bath and beach towels. This was not our first time renting from Mendocino Preferred, but it was our first time in this specific property (Whale Rock). It was AMAZING!! What a beautiful location and the house is fantastic and cozy!! We loved it! As always, the MP staff was fabulous! They had a sign on the window wishing us a happy anniversary, they left us a bottle of wine and a doggy bone for our canine. They even helped me arrange for a small surprise for my husband upon arrival. They were awesome! We loved it so much we already reserved our week long stay for next year! Truly incredible location! return. I would like to see the hot tub replaced and better lighting in the kitchen, but overall it is a great house to kick back and enjoy the view. Recommending property to anyone else would depend on whether the owners have cleaned mold in one bedroom and done something about dirty carpeting in two bedrooms. The home is great location, but owners must maintain it if they are going to charge what these folks did. 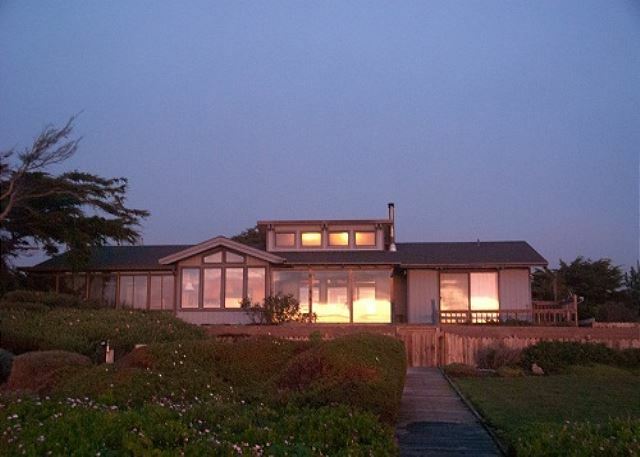 We enjoyed five beautiful days in this fabulous home watching the ocean from nearly every window. The home is well-maintained and very clean. The kitchen is well stocked. It’s a joy to cook in the kitchen while watching the waves crash against Whale Rock . This was our favorite place to stay in the Fort Bragg area yet. The beach access is wonderful. The house comfortably fit our family of 4 + dog. The dog seemed like the biggest winner with the easy access to a large sandy beach. We enjoyed everything about our stay except having to leave. This is a one of a kind property. The view is spectacular with the Whale rock beach at the bottom of the stairs. A dream home except for very obvious heavy dust everywhere, needs a good top to bottom cleaning by a professional crew. Probably more than the regular 1-2 housekeepers can handle. Thank you for the review. We are so sorry about the dust! Whale Rock is getting a new deck and despite our best efforts to keep the mess outside it seems some got in. We're so glad you enjoyed the home besides that. If you stay again at Whale Rock we promise a new deck and no dust next time! Thanks again for the review and for staying with us! This was our third stay at Whale Rock in 4 years. The location is fantastic with spectacular views and convenient access to the beach. They have made a lot of improvements over the last 4 years. Our only complaint is that they were replacing the walkway to the hot tub so getting there was somewhat difficult and unsafe. There was also yellow caution tape which distracted from the view. Mendocino Preferred was very apologetic and made every effort to make temporary repairs. They also compensated me to the best of there ability. I would definitely recommend staying there and I will return in the future. We have stayed here twice now. We love the home the view and the easy access to the beach! This was our first time staying at Whale Rock and we were NOT disappointed. The weather was a little bit wetter than we had hoped however with a view like this we couldn't have wished to be in a better house. We were able to see whale activity right from the bedroom view. The pictures and details on their website are accurate as well. Critique: The master bath skylight did have quite a leak during the evening down pours which we needed to put a bucket under. When we mentioned it to the management they confirmed they were aware and that they had a new skylight on order. The second morning we received a phone call asking if the hot tub repair man could come over. We just would have liked both of these issues brought to our attention ahead of our visit. It wouldn't have changed our plans however it would be better service. We were refunded $50 for the hot tub inconvenience which has been customary when we have used other property management companies. All other interactions prior to our visit with Mendocino Preferred were friendly and helpful. We would love to return when the weather is better so that we can enjoy the convenience of the beach access. Loved staying at Whale Rock. 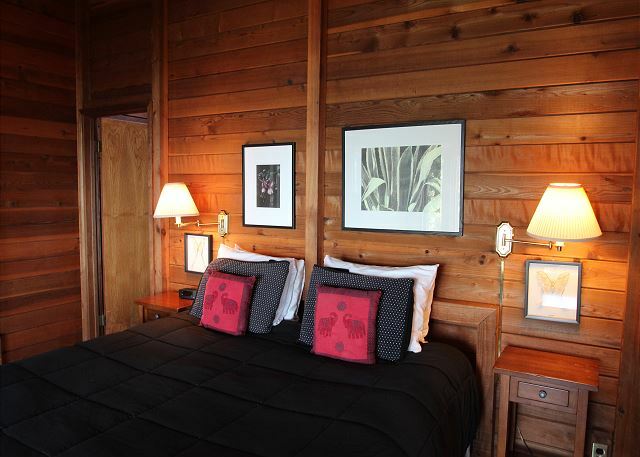 Have stayed at several Mendocino Preferred properties and have always been happy. View was perfect. Covered and protected deck area was very nice. Gardens were beautiful. 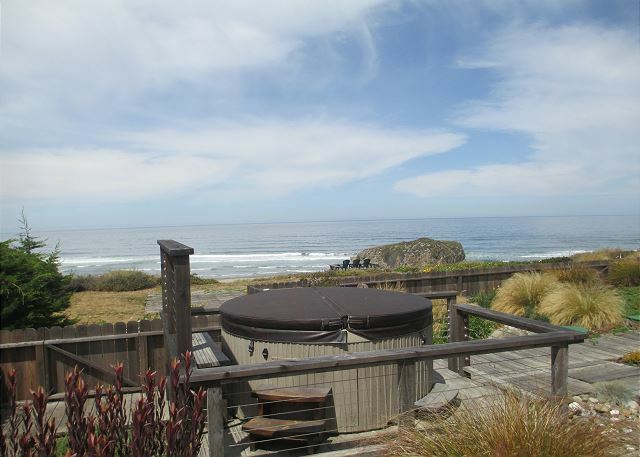 it doesn't get any better than Whale Rock, all one could ask for in a rental home. We loved this place. All three bedrooms had queen/king beds. The master and second bedroom had full views of the ocean, and the third faced to the back of the house, which was nice and quiet. The layout was perfect, with the family room/kitchen facing the ocean. The location is the best - right on the bluff overlooking a beach where all dogs run happily off-leash (not sure if this is officially condoned, but it's definitely the established tradition at this beach). The stairs to the beach are right next to this property - there's a small gate from the property onto the stairs - very easy and convenient. The house's location above the beach (with that tremendous view!) means there are many stairs to take to get to the beach (I counted over 80), but they're well-maintained and felt safe and secure. The house is very nicely furnished and was clean with fresh sheets. 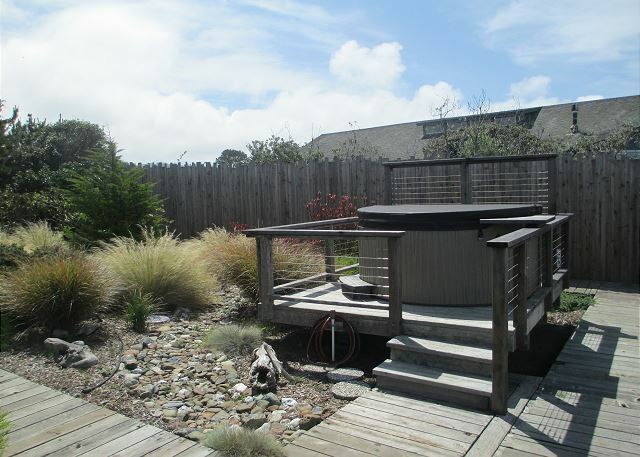 The hot tub was incredible -positioned privately with a view of the ocean. For dog owners it's worth noting that the yard is not quite fenced in. We brought one 6-ft section of folding gate with us to fill one gap. We'll bring a second the next time and that will close in the yard. 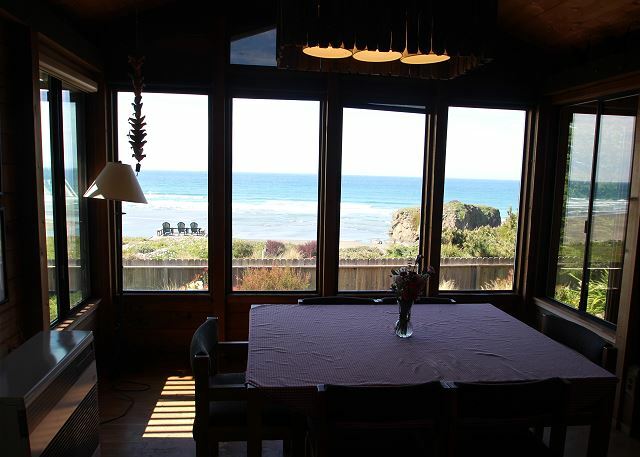 And yes, we will absolutely be back for many vacations to this breathtaking home on the wild and scenic California coast. We have stayed at this house so many times we call it coming home when we arrive. Quiet, private, beautiful, unpretentious, welcoming - I always love staying at Whale Rock. I just always wish I had more time to stay here! 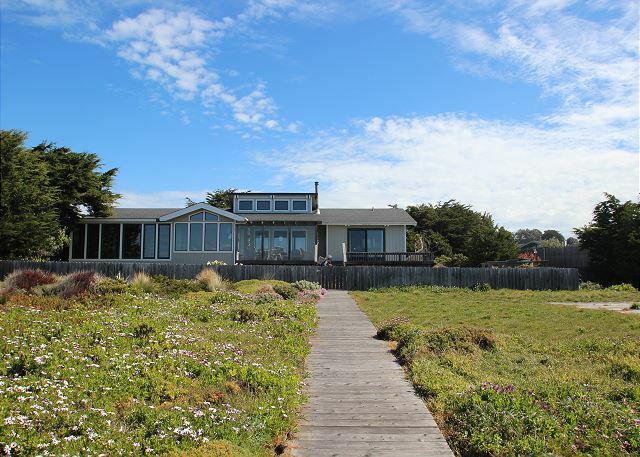 Fort Bragg is one of our favorite locations and this house was a perfect place to enjoy the ocean and the peace and quiet! Great access to the beach - with stairs, no cliff climbing! House had everything we could need for the weekend. Mendocino Preferred was an outstanding outfit to work with. The representatives were organized, had great communication, and added personal touches to our stay. To top it all off, the place was amazing! It had all the amenities (just needs a firepit), very cozy, plenty of views and ocean sounds from every room, and is right at the beach. Unbelievable and can't wait to return! Comfortable, clean house! Super cute! Views and beach access were amazing!!! Only complaints were I wish garage game room was fixed up better and a fire pit in the backyard would have been a bonus. We will rent this house again very soon!!!!! Whales watching was the highlight of every sunset. the staff at Mendocino Preferred was so personal. I felt very in touch with them during the entire rental and stay at the property. Great Job renting this home. 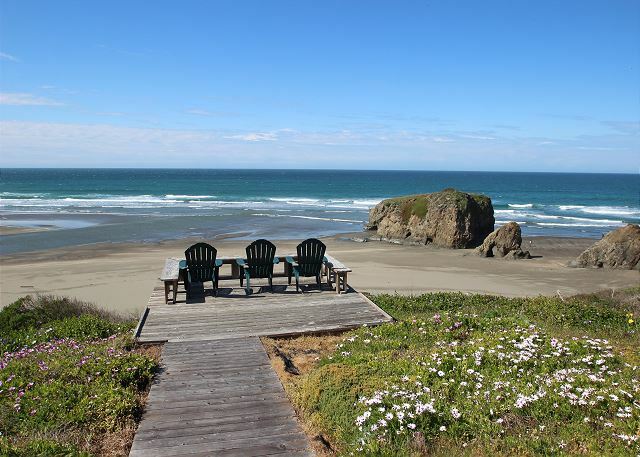 My husband and I have rented many places along the Fort Bragg & Mendocino Coast and this was by far the best. Very quiet and private from neighbors. This home has easy access to the beach, there are a lot of cement steps to get down to the beach but they are not steep. I am slightly disabled and was able to climb the stairs 3 times a day. If you can't climb the stairs there is a beautiful sitting area over looking the beach so someone could enjoy seeing their family down there without feeling too separated. The home is rustic, charming and was very clean - BIG kudos to the folks who care for the home in between renters. I am fussy about cob webs and there were none inside or outside. The home is well equipped throughout. This rental offers a GIANT TV with hundreds of blu-ray movies to select from. Not junky movies, but 5 star movies and up. The home owner went so far as to catalog all the movies ( which are in alphabetical order on the shelves) in a handy book so you can sit on the comfy sofa and select your movie. It's a very nice 'movie theater experience' set up. There wasn't internet, but my cell phone & iPad worked just fine. No problem getting a signal. This was a fabulous place to stay !! We will rent this home again if they will have us ! 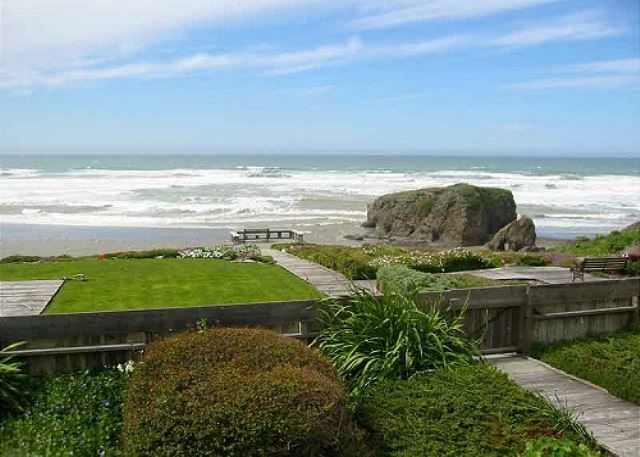 Whale Rock is a beautiful house in a great location with a fantastic view of the ocean! We had sunny weather during our 4 day stay in early April 2017. The house was very clean. The kitchen perfectly stocked. The perch was great for morning coffee. We usually rent homes further south of Ft. Bragg, but liked this house so much that we will come back again!! The property management company was very easy to work with. This is a great rental home! This was such a lovely and comfortable place - well appointed and we were lucky with the weather, but would have enjoyed it regardless. The house is undergoing some upgrades which will be nice when finished. We enjoyed the short easy walk down to the beach and our time on the beach. View was outstanding. We did not realize, however, it is an off-leash beach so we did have to take care with our dog who was on a leash. I also submitted some additional comments in an e-mail to the property management team for their review. Best location on the coast. We love Whale Rock! Great stay. However - there was some construction going on in the master bedroom office - would have been nice if they had notified us ahead of time. We have been to this house many times over the years and do sometimes use that small room. The location and view from this house is amazing. It is a great winter house as the enclosed porch off the master bedroom lets you watch the ocean even in the biggest storm. Fantastic. Perfect location. Very nice house. I don't know how to say enough. Sitting out on the deck, looking up at the Milky Way and the stars was wonderful. The house was well equipped and clean. this home is fabulous! So nice to be able to get down onto the beach, which is rare for a rental place in Fort Bragg. fun to read all the old movie posters around the house and to see the woodland creatures displayed all around. We've been renting this home for the past few years and will continue to do so. They even made posters for us since it was my birthday and my son and daughter in laws wedding anniversary. Attention to detail, always! Greatest Vacation of a Lifetime!! Wonderful!! The house, the exceptional view from every window in the house was unbelievable. The inside decorations of birds & animals around the ceiling rafters was a great touch. The yard garden area was in bloom and with the slight fog we had the colors just popped from all the flowers. My husband had a new camera to try out and got some fantastic shots of the house, flowers and beach from the property. Our two small dogs had a great time exploring the yard and beach and with designated doggie places, had no problem with clean-up. Everything worked great and we can't wait to come back. Only downer was that on our last day when I came out to take the path down to the beach, someone had stolen the rope that provided the handrail for the steps down. Still, got in the car and drove down to the public access and still got in our walk. Hope you get it replaced soon. 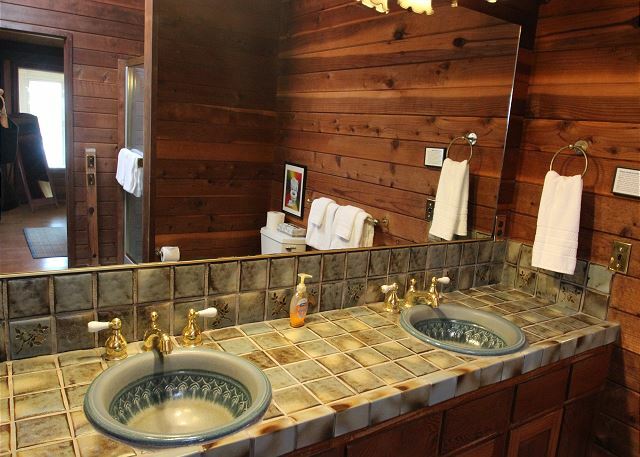 Also, you might possibly install some type of lighting in the master bath shower. It was very dark in stall trying to take a shower after dark. 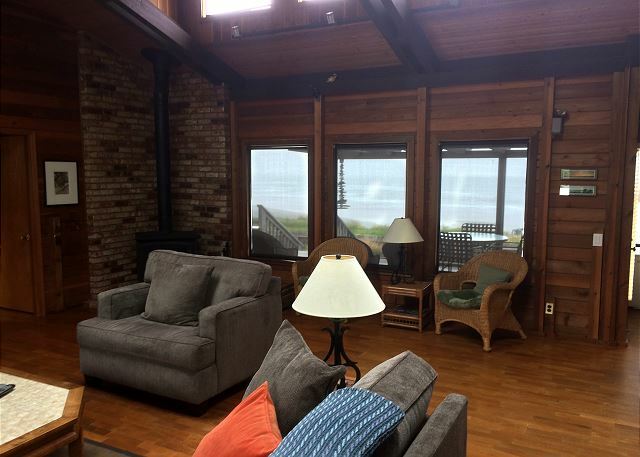 Really, this is an incredible house and no one could ask for a better location and view of the beach. I have already recommended it to many people and with your internet site they can view the house almost immediately. Thanks for a great vacation. My family and I had a wonderful time here. The views are spectacular. And just step out the door and you're practically on the beach. The kids loved playing in the surf and sand A very peaceful and restful place. We enjoyed every minute of our time here. Only 10 minutes or so to shopping and restaurants. I would definitely recommend this place to anyone who love the ocean. My grandchildren want me to sale my home on Lake Almanor and buy a house on the ocean now and didn't want to leave. The house is very nice and well furnished with just about everything you need. We will most like rent this house again next year. I just can't say enough about this place. We will return. Excellent ,beautiful , Realxing and amazing. We loved it at the Whale Rock House. Right on the beach and all the amenities you need included. Bring food and yourselves and your good to go. Fabulous! Spectacular view home and added bonus of beach access. Low tide makes for a great walk and picking up sand dollars was fun. We ate in all four days/nights, except one. Kitchen was well stocked with cookware, etc. Only thing I couldn't find while we were there was a steamer basket. Balled up aluminum foil in the bottom of the pot was perfect for steaming our lobster tails. We would definitely stay at Whale Rock again! The property was all that was promised and more. I took my 95 year old mother and my stroke victim husband, who is in a wheelchair, and everything worked great. The house felt like home when we walked in - welcoming and warm! We really enjoyed the views and spent many hours on the perch. Weather was beautiful - We did have some unexpected guests - I believe a family of raccoons is living under the porch or side area. We saw lots of birds, a fox, and beautiful blue heron. My mother's little dog enjoyed playing on the beach and we loved the walking in the sand. The only problem we had was with the television. It had sound but no picture. The manager brought us out a small one but we didn't use it much - read books, worked puzzles, and used the hot tub! Wonderful place and can't say enough about it. This was our second time staying at Whale Rock. Last year we stayed for 3 days and that was not near enough. This is a beautiful house in a fantastic location. The fact that the stairway is adjesent to the house makes this an even better location. We spent a lot of time on the beach as well as the deck overlooking the ocean and beach. Whale and seal sightings added to our joy. The living room couches and dining area chairs are way beyond there useful lives and the padding is in very sad condition. Other than that everything about the house is great. The master bedroom bed is very comfortable. We stayed the first weekend in April and got the best weather ever. This home is very warm and friendly the moment you walk in the door. The Kitchen is well stocked and we wanted for nothing-except salt- so we left a box. I know this is a property that allows pets. but the garage area stank so bad of urine that we could not use the ping pong table- I would suggest removing the carpet. there were cobwebs throughout the house and major dust bunnies behind the couch and TV. -All in all it was a great stay I just thing a more thorough cleaning is in order. The moment you walk through the door you feel welcome & at home! Everything you need is there, just bring food & clothes and your friends or family and enjoy life!! We love it here, it's perfect. We went on a family trip to the coast for Christmas this year. Our stay at whale rock was awesome. The views from the house are amazing, we loved the beach access, and the kids had so much fun playing ping pong. 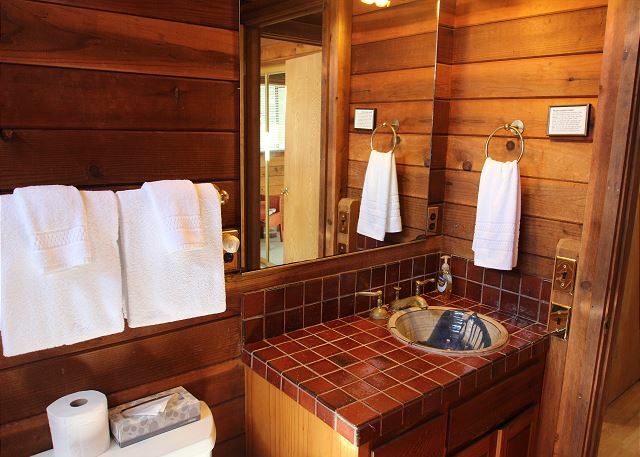 I can't wait to try all of the Mendocino preferred vacation properties. We will definitely come back to whale rock again! We had a wonderful time at Whale Rock. Wintry weather delivered dramatic views and huge waves. It also encouraged lots of cozy family time. We loved the place. 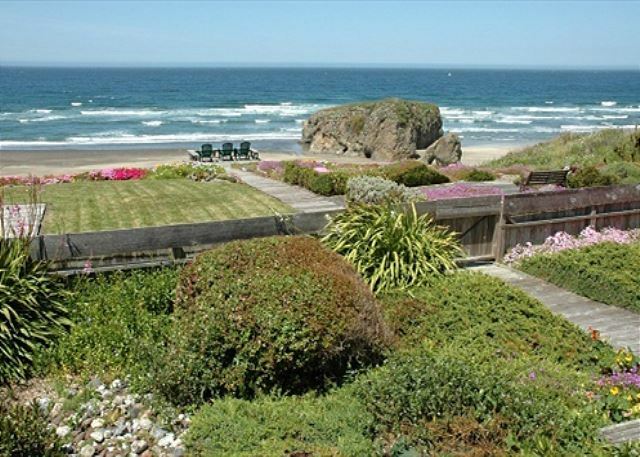 This home was located almost a4 hours drive from the Bay Area or Sacramento.the location was outstanding, beautiful long and wide beaches. The house was perfect for two couple having a bathroom on opposite side of the home.. There was a third bedroom. With no bath. Everything was perfect. Couldn't find anything wrong. Had a great time. We've been back three times - it's so perfect for us! Home is comfy, private, yard is beautifully landscaped, perfect for our dog, lovely view, and the bluffs deck lures us out to sit and enjoy the air and ocean view! Doesn't get better than this! Beautiful and peaceful place to relax away from everything. this was one of the best experiences I've ever had and I've been renting houses in Fort Bragg and Mendocino for over 25 years! Mendocino Preferred went the extra mile to make things wonderful and memorable. A grand time was had for sure! Only regret was having to leave so soon! This home has a spectacular view of the ocean. It was great having steps leading to the beach. The beach was fantastic and nearly private. Enjoyed exploring and examining the tidal pools. We saw more sand dollars than ever before and also live star fish. A wonderful time. It was lovely, steps to the beach. The view was stunning. Sometimes Location is Everything! The first views of the ocean when you walk into the house are breathtaking! During our four day stay we only left the property one time to visit glass beach and one state park. Why leave paradise? We had our two grand children with us ant they totally loved the beach and it's relative isolation. The house was great in every way, comfortable and well equipped in every way. We will be back for future vacations!!!! 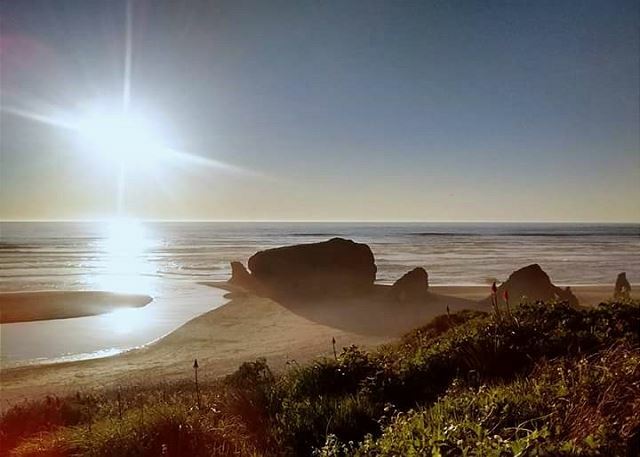 Beautiful Seaside Experience: Whale Rock has it all!!! Our weekend family reunion at Whale Rock was an experience we will all remember. It had something for everyone. Comfort for those who stayed on the property. 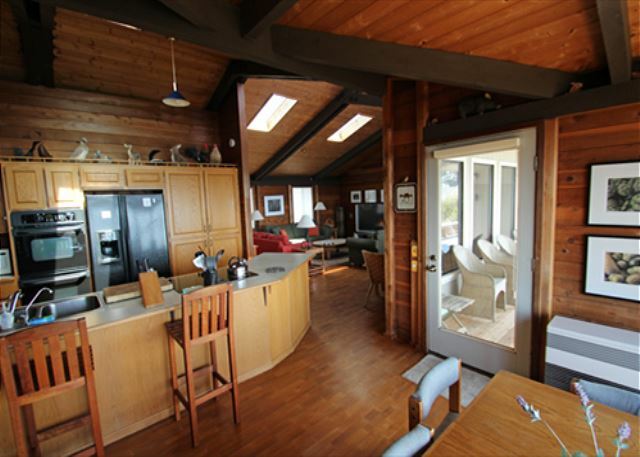 Great location from Fort Bragg and Mendocino. 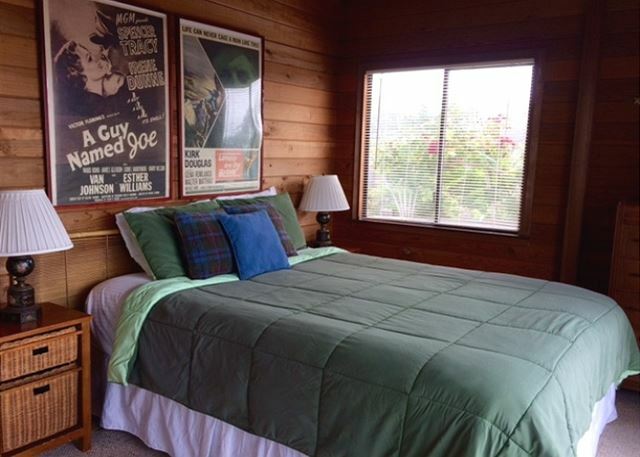 Several cousins chose accomodations in town and the village of Mendocino. The direct beach access was the best feature, great for those who wanted sand and surf. 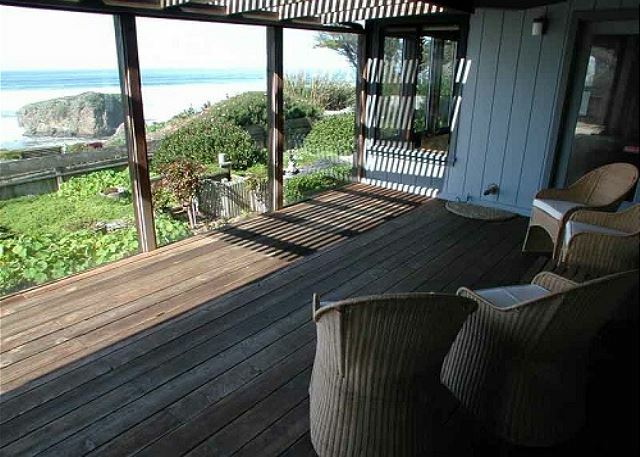 However, for those who chose to gaze out over the pacific from the deck the view was spectacular. We all came away with fond and endearing memories! The house was amazing: well stocked with a tremendous view. We spent a lot of time walking on the beach and looking at the waves. As other people mentioned, our AT&T cell's voice service worked though we did not have internet service. We appreciated all the movies though the TV set up was hard to understand with 3 remotes controlling different things. The grey remote really only worked to turn the systems on and I used the other 2 remotes to control the devices. This was different than the instructions. I finally worked out how to play a DVD on the second day! I would recommend the property owner update the two toilets, dishwasher and washer to later models which use less water. Then they would not need to have signs everywhere about water consumption. As beautiful as these photos are, it doesn't do the location justice! We kept those chairs overlooking the ocean warm for much of our visit. We watched whales migrate and sea lions swim in and out of the inlet below with the changing of the tides. We walked down the 82 steps to the sand beach below and enjoyed having the beach pretty much to ourselves. The waves crashing on the rocks were spectacular. We visited in May, and the flowers in the garden were gorgeous as well. Each night we sat in the hot tub and looked at the stars, and listened to the ocean with the windows open at night. The location is a bit out of the way, but worth the drive. And the drive was easy to get to Fort Bragg or Mendocino - no crazy drop offs like other places along the PCH. The house worked well for two couples traveling together as bedrooms are at separate ends of the house, and we each had our own bath. Everything you need to prepare meals and entertain ourselves - DVDs, books, games - were well provided for. We booked nights in several locations, and we all agree - we wish we had skipped those and just stayed here! We had a great relaxing time! Love the house. There are a few minor repairs that needed to be done. Smoke alarm went off three times in the middle of the night. Needed new battery. Staff was quick to respond and send someone to repair it. Sink tap handle in master bedroom falls off. Overall, the house is a beautiful setting and very comfortable. Views from every window! We had a fabulous long weekend with two other couples! Wonderful location! Whales, ospreys, and seals right out our window! I would highly recommend this property to friends and we are already making plans to come back! Mendocino is a special place with great eating establishments and things to do! The view was amazing. Sitting out on the overlook sipping champagne couldn't be better. Furniture in living room could use some help. Also for a rental the TV CD and DVD situation was extremely confusing. Directions were followed to the letter and nothing happened. Cindy from rental office came out and showed us how to do things, but she wasn't following written directions. Rentals should always keep those kind of things simple. The three of us have very much rental experience between us. We all agreed the best thing about Whale Rock was the view. I would recommend Whale Rock but make known the failings. The picture in the property description do this rental justice - amazing location with our own perch overlooking the ocean, beautiful well-kept yard, the house comfy and clean, accommodating for all our needs, and private - couldn't ask for more! Perfect location to get away from it all! We stayed for a week at WR. 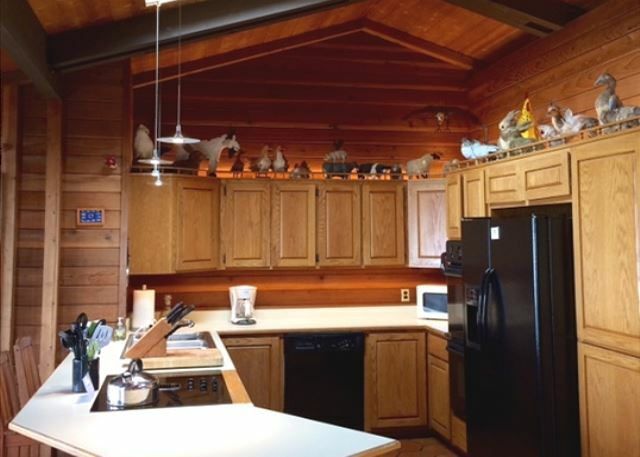 The property is very clean and everything was well explained and laid out before our arrival. Amazing sunsets, great weather and lots of whale sightings made for a great time. We took our two Dobermans to the beach twice daily which was really easy with the pathway right on the property edge. Only con to the property is that there is no wifi and cell coverage (AT&T) is very poor, however this is not a bad thing if your looking for time away from the hectic pace! We plan on going back very soon! Great time at the Whale Rock House! Everything was perfect. The location couldn't be better. We had wonderful weather to be able to take advantage of the beach nearby. The house had all the amenities we needed plus a lot more! Lots of windows gave incredible view and everything was very clean. The house came with a great supply of books, games and videos as well as a big screen tv (dish satellite). Beds were comfortable and it all had a cozy, home-like feel. Enjoyed every part of our stay. The Monitor heater in the dining area was loud. The lighting in the living room and over the range top could be better. Just a note: Graeagle is spelled Graeagle. 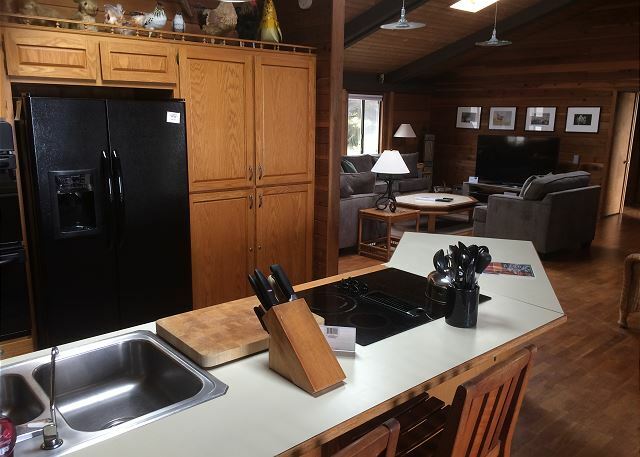 Wonderful place to spend christmas, awesome kitchen set-up, love the double oven. Comfortable, beautiful home, have stayed here before and will be back for sure. A few suggestions: Sliding glass door in bedroom was sticking so upon getting down to clean runner I was poked with something sharp. White curtains are hemmed by straight pins and safety pins. Very tacky! My friend dropped an earring in couch. Got flashlight to get earring from underneath couch. Floor underneath is covered in dirt and dried food the whole length of couch. Gross. Two very easy fixes for such a beautiful home. Thank-You, will be back soon. 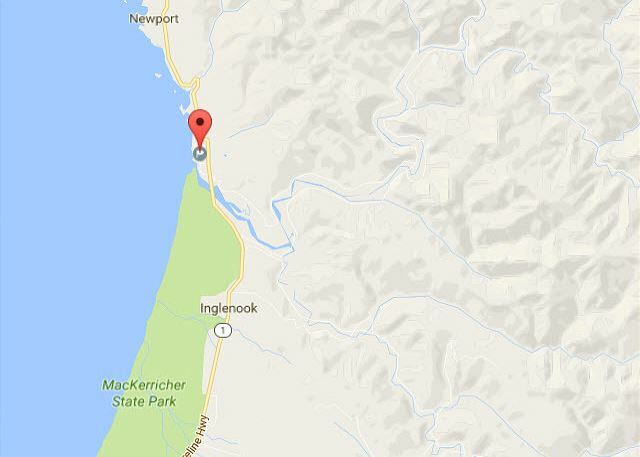 First, Whale Rock's location at the confluence of river and sea is stunning. 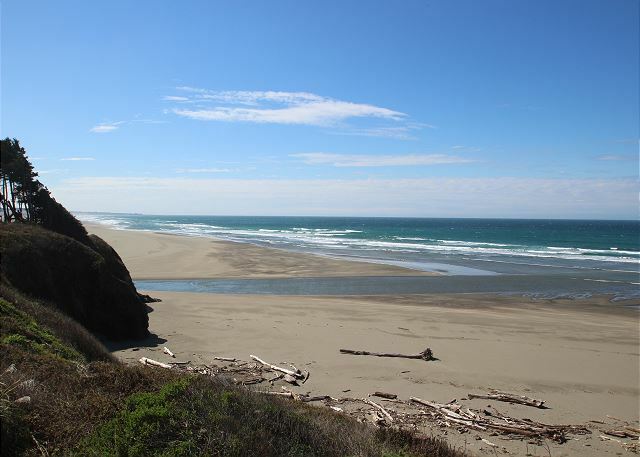 Beautiful whitewater and seastack views, and easy access, (85 well-maintained steps) to the beach, to TenMile River Marine Conservation Area and across the wadeable river to the miles-long MacKerricher Beach. The house is set up well for two couples, with bedrooms and bathrooms on opposite sides of the main core of the house. The kitchen and dining area entertain well, though the dining room chairs are ready to be recushioned. 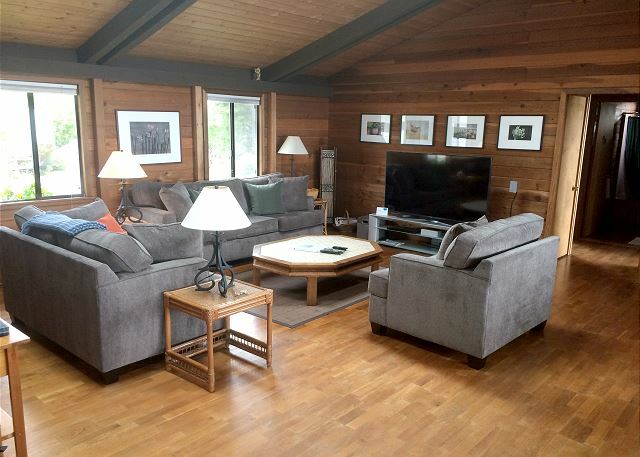 The living room couches are comfortable and cozy with a roaring fire going in the wood stove. The sunroom off the master has two very comfortable chairs in it, but was cold at the time of year we were there (November), a central pane of glass is discolored marring the view, and paradoxically this room bars access to the outside from the Master. The master bed was a bit too hard for both my husband and I, who do like a firm bed. The wind-protected patio immediately off the dining/living area was a really sweet spot, being warm and allowing lingering outdoors even with a chilly day and crisp breeze. 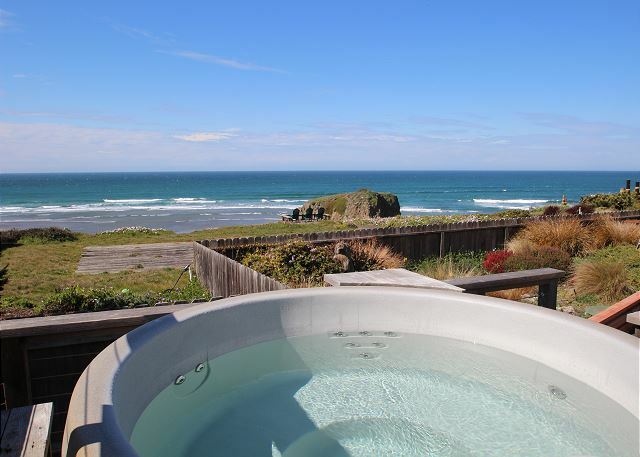 The hot tub is in an awesome view spot -- blissful after a day walking the beach. My only beef about this property related to misrepresentations about Internet access. The property has neither wi-fi, nor reliable cell service on AT&T. 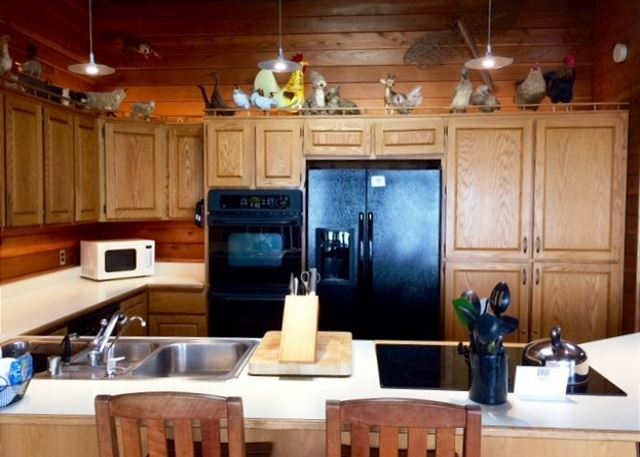 While I am happy the VRBO listing is now fixed after expressing my dismay, I do want to note that when I expressly asked the management company whether there was cell service at the house, they assured me that there was. I'm all for unplugging periodically, but only when I choose the time, and especially not when the property manager has assured me that it would be there. So go planning for an unplug vacation and you'll love it at Whale Rock. The final stormy morning with spindrift streaming off the tops of the huge aqua waves was truly inspiring! A week of beauty and carefree comfort; easy access to the beach by community-shared steps, dog friendly, people friendly, all amenities provided very well, house was warm and cozy and clean when we arrived. Loved the yard and walk out to the little ocean perch - spent lots of time there. Will definitely revisit Whale Rock! The location couldn't be more perfect. There are spectacular views at all times of the day, an easy path down to the beach, and supplies for everything you would ever want to do in the house. We also had a really fantastic experience with the rental management agency. They were very quick at responding and a pleasure to talk to every time. Will definitely stay here again, and if you are looking at this house as a possibility for a stay I couldn't recommend it more highly! We stayed from Sunday evening to Friday morning. The house was perfect for our family of five. Great access to the beach. About a 10 minute drive back to Ft. Bragg. Lots of good running trails. We visited MacKerricker st park, glass beach, as well as rode the skunk train. Hot tub was nice after a dip in the cold ocean, as well as in the evenings. This is a great house to stay at if you don't plan on going anywhere. We didn't! My toddler loved the beach and playing in the backyard. We saw whales, sea otters, seals and lots of other wildlife. The kitchen was pretty well stocked with just about every utensil you could need.